We study how to stabilize the presence of topological defects in liquid crystals, in particular in order to control it, for subsequent self-organization of nanoparticles In thin smectic films, the interfaces can induce frustration, inducing formation of self-organized networks of defects. Here, the smectic layers are perpendicular to the substrate and parallel to the interface with air. 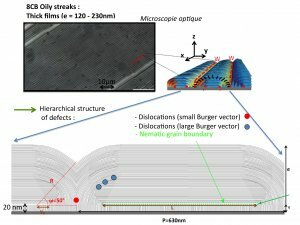 We have shown in the past the structure of the frustrated smectic film (so-called “oily streaks”), on crystalline substrates, mica and MoS2, and its evolution when the film thickness varies [18, 20, 23, 30, 35]. We have shown that the smectic layers are bent to form stacked hemicylinders, flattened and parallel to the substrate (Figure). At the joint of two neighboring hemicylinders there are curvature walls (W in the figure) whose presence is required by the fact that the film must be as flat as possible (large air surface tension). Closest to the axis of curvature of hemicylinders, there is a rotating grain boundary which prevents the establishment of curved smectic layers whose radius of curvature is too small (RGB in the figure). On rubbed polymer substrate (PVA), we managed to orient hemicylinders in a single direction perpendicular to the polymer rubbing. 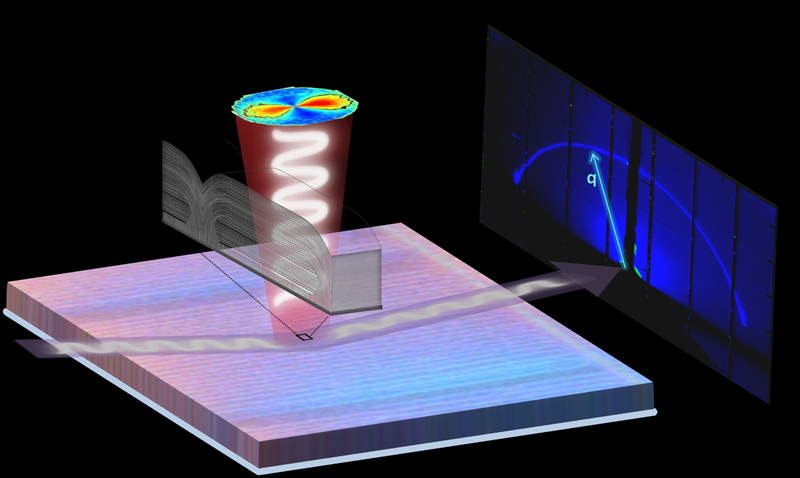 By combining X-ray diffraction and ellipsometry , we highlighted the nature of topological defects associated with the presence of grain boundaries and have revealed how the shape of the grain boundaries is closely linked to the presence or absence of these defects . We show that the RGB shape is related to the absence of dislocations at the base of the grain boundary, dislocations all being released at the top (Figure). These frustrated films can finally be seen as one hierarchical structure with three types of defects of different size and shapes (Figure) : dislocations at the base of W (weak Burgers vectors) at the top of RGB (large vectors Burger) and a wall, made of melted (nematic) smectic layers, between a sub-layer of perpendicular smectic layers closest to the substrate and the curved smectic layers . We are currently exploring how these periodic defects allow control of the self-organization of nanoparticles, but also how to change the assembly of defects, for example by varying the substrate structure of the sub-layer perpendicular smectic layers. Collaboration : B. Gallas, M. Goldmann (INSP), B. Haj Ibrahim, A. Di Martino (de Physique des Interfaces et Couches Minces (LPICM), Ecole Polytechnique), B. Zappone (CNR-IPCF, Liquid Crystal Laboratory, Universita della Calabria, Italie), A. Coati, Y. Garreau (Synchrotron Soleil, Saint Aubin), N. Boudet (synchrotron ESRF, grenoble).